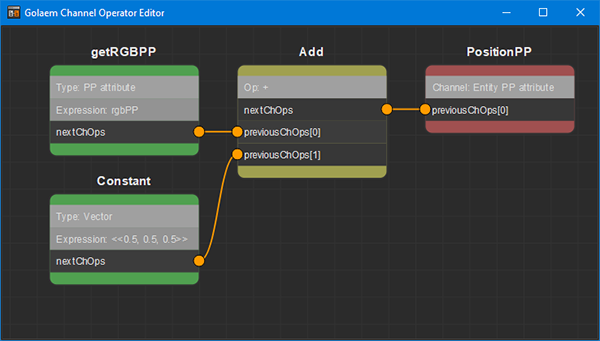 The Channel Operator Editor allows to manipulate the graph of Channel Operators that are available in the scene. It will display every channel operator node present in the scene, whether it's connected or not. 'F' will focus on the currently selected Channel Operator nodes. If none are selected, it will focus on all of them. 'L' will automatically layout the selected Channel Operator nodes. If none are selected, it will layout all of them. The Channel Operator Editor is also able to display debug values, as shown in this page.